The photo above shows me (third from left) sitting on the right shoulder of a beautiful sculpture of an angel in front of the building where I took piano lessons when I was 8. 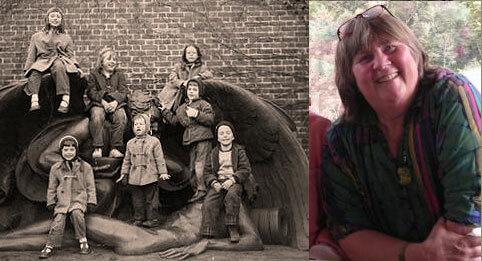 Clearly, I've been relying on angels for decades. It was at this same age that I experienced great meaning and bliss during a harmonious campfire singing at Girl Scout Camp. That memory has fueled my lifelong delight in singing as a deep community healing experience, certainly a spirit that has carried through into the Threshold Choir. The seed for the Threshold Choir was planted in June of 1990 when I sang for my friend Larry as he lay in a coma, dying of HIV/AIDS. I did housework all morning and was terrified when the time came to sit by his bedside. I did what I always did when I was afraid; I sang the song that gave me courage. I sang it for 2 ½ hours. It comforted me, which comforted him. The contrast between the morning and the afternoon was profound. I felt as if I had given generously of my essence to my dear friend while I sang to him. I also found that I felt deeply comforted myself, which in turn was comforting to him. A few years passed, and in August 1997, while driving home from Montana, I committed myself to sing for any animals I encountered that had been killed on the road. It felt good, and I continued long after that trip was over. It is still my practice. I stop whatever I am doing (except driving), turn off the radio, and sing a small song I wrote that begins "May your spirit rise safely..." These two moments, combined with my love of singing with wonderful women and being of service, were the inspiration for the Threshold Choir. Once I had conceived the idea, it took a technological understanding of how to communicate with many people at a time to let this idea fledge completely. I bought my first computer on December 29, 1999, and began to fool around with it. Three months later, on the vernal equinox (March 21, 2000), the first Threshold Choir gathering was held at Katharine Osburn’s home in El Cerrito, California. Most of the 15 gals present at that evening (which at one point was suffused with golden light) are still active in the choir. I am so very proud of that fact. The East Bay and Marin chapters started at that time. Six months later, I started the San Francisco and Sonoma County chapters. Six months after that, I started the Bolinas and Peninsula chapters, and then the Santa Cruz chapter. Chapters are currently forming in many states in the U.S., provinces in Canada, and other places around the world. As of 2012, there are about 100 chapters worldwide, with people doing this work as volunteers, singing to folks who are facing death, grief, or suffering. Kate held the staff position of Creative Director of the Threshold Choir from 2011 through 2014, then retired from this position at the end of 2014. You can reach her at this EMAIL.